It is a fact of life that cats can have an occasional hairball. Truthfully, our feline friends are well-designed to be able to ingest large quantities of fur without digestive trouble. Cats are meticulous groomers, and some seem to spend the greater portion of most days grooming themselves (when they’re not sleeping of course!) As a result, they do ingest a fair quantity of fur, and their GI tracts are designed to handle it. On occasion, hair may collect in the stomach and aggregate into a solid mass (called a trichobezoar), too large to pass into the intestine. This can result in vomiting, and production of a hairball in the vomitus. How often should Fluffy have hairballs? There is no one size fits all answer to this question. Longhair cats tend to have more frequent hairballs than shorthair cats. 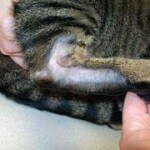 When cats are shedding more, as can happen in the warmer months, more hairballs may be seen. 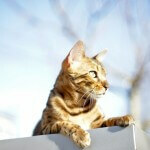 For the average shorthaired cat more than 1-2 hairballs a month would be considered excessive. For a longhaired cat, 3 hairballs a month can be abnormal. Brushing Fluffy more frequently, particularly if she’s a longhair cat, can help minimize shedding and hairball production. In short, hairballs are rarely a primary problem, but an indication of some other disease process. An occasional hairball is not a cause for concern, but multiple hairballs per week, a sudden increase in frequency of hairballs especially if coupled with weight loss, or hairballs in conjunction with hair loss are all indications to have Fluffy evaluated by her veterinarian. Sometimes, the solution to hairballs is as simple as selecting the right diet, particularly if a food allergy is suspected. A word about PetroMalt and other hairball remedies: I once heard an internist say at a lecture on feline internal medicine that “cats with hairballs don’t have a grease deficiency”. In other words, greasy supplements designed to help cats pass hairballs are ineffective because they are broken down rapidly by stomach acid. 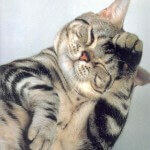 Cats don’t vomit hairballs because they lack “lubrication” to help the hairball pass! These products are not dangerous, but are unnecessary and ineffective. Getting to the root of why Fluffy has hairballs in the first place is really the best solution.